After a year of doing cookies, I have decided that it is time for me to have a "Signature Cookie Style"....So....after lots of thought...here it is...The Cookie Puzzles' Signature Style...A slightly imperfect, a little on the amateurish side, cookie, with an occasional bleeding colors and terrible writing. So when you see my cookies, and they don't look perfect, please don't be embarrassed for me...that is MY SIGNATURE THE COOKIE PUZZLE look...I worked really hard on it..see...if I WANTED to, I could make perfect cookies...but then how would you know it was a THE COOKIE PUZZLE cookie. Over and Out. What can I say...A perfect cookie decorator I am NOT! And you know what? I am ok with that...really I am! Do I "want" to make the perfect cookie? Yes! Every cookie I sit down to decorate, I want to make perfect....it just doesn't happen. And that is OK....cause I decorate cookies because it makes me happy. People buy my cookies because they TASTE good...how it looks is just ICING ON A COOKIE! 3. MAKE A GREAT TASTING COOKIE...IT WILL MAKE PEOPLE FORGET THE FLAWS IN THE DECORATING. 10. ASK FOR HELP, I CAN GAURANTEE YOU THAT OTHERS HAVE DONE WHAT YOU ARE TRYING TO DO...ASK..YOU WOULD BE SUPRISED HOW MANY OUT THERE WILL HELP, IF YOU JUST ASK! So there you have it...my cookie philosophy! Now you can conquare the world..well not really, but humor me a little! Here are some photo's of some of my first cookies...don't laugh...they are NOT pretty...but you know what...that's ok...I really don't care! My very first cookies...see..not so pretty..but they tasted good! The outlining is terrible...the dots are un-even...but who cares! So...there you go...now go have fun..enjoy what you do....don't strees...IT IS JUST A COOKIE! Soo....lets take a little walk down memory lane shall we...well you probably don't remember some of this stuff...but don't worry...I will fill you in...these are my memories...but I wanted to share them with you....are you ready...ok...let's go! 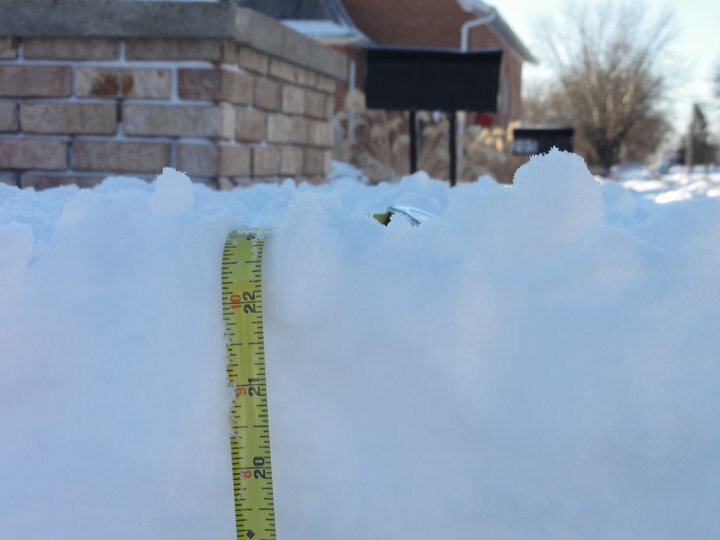 23 inches of snow! In my front yard! This is how much snow we got in just over a day...It was crazy...so what do you do to pass the time, when EVERYTHING is closed...you bake of course....so that is what I did...but that is a post for another day...today..I am talking my logo and blogging. So I baked and decorated my first cookie in February of 2011....and by November of 2011...I decided that I was totally hooked...great...now what...people are asking to buy cookies...asking for business cards...what is the name of my business.....crap....I don't have a business name...or a business card...or a clue as to what the heck I am doing. Now...Lindsay is like my fairy godmother...except she is way younger then me.....and way cooler then me...and way more artistic them me. Lindsay is my hair dresser! When I first started going to Lindsay...my hair was past my shoulders.....now, well, it is a super short pixie cut. Now, many will say...big deal.....well, I am hear to tell you it is a BIG DEAL...I have SUPER THICK hair...and normally, THICK HAIR + PIXIE CUT = NOT SO PRETTY! But Lindsay....she has magic siccorrs...magic I am telling you...pure magic! Thanks to her, I can do my hair in like 2 seconds (well, maybe more like 2 minutes) but the point is I LOVE IT...and her! Great Kim....get to the point! OK here is it ...I finally decided that I needed a logo...so I begged, well not begged...but begged sound way cooler then asked...but I asked Lindsay to create me a logo. I told her my name The Cookie Puzzle...it had to have puzzle pieces in it (duh) and it had to have four colors...blue, green, red and yellow...true colors...no shading...remember shading is a no no for Collin! So...a few days later, she handed me these! Cute right? So I decided to go with the first one....now that I did not like the second one, it is cute, but I just loved the first one! Lindsay is super creative...I mean...really creative...she does amazing hair and color...so if you need a hair stylist...and you are in Columbia Missouri, give me a holler...I will let her out of my basement, cause I keep her chained up and bring her out every 5 weeks to cut my hair , JOKING OF COURSE, I can put you in contact with her! So great, now I have a logo....I logo drawn on paper, in colored pencil! A super computer savvy person would totally scan the picture, adjust the colors...and do a bunch of other totally cool, computery stuff with it. NOT ME! I have no idea how to scan a picture (don't judge), I tried, but I got confused...and well...I just didn't scan it. OK...deal with it! So..I have a logo...and I need business card...so I did what any "I know NOTHING about anything graphic" I cut out the picture, placed it on a cake board, and took a picture of it...yep..that is what I did. I took a picture with my digital camera, uploaded it to a site and ordered business cards...yep..."I am big time now" I thought. And you no what....it worked! I had business cards with my name, my logo and all the other important information on it. Then...I decided that I wanted my logo "cleaned" up a bit...and I wanted "The Cookie Puzzle" on it...again....I have no idea HOW TO DO THAT! HOW COOL IS THAT? Erica did an AMAZING job on my logo...it is the same...but better! I can not tell you how much I LOVE IT! Thank You so much Erica! If you need graphic computery stuff done...contact Erica...she was able to take the vision in my head and make it a reality! I really think she has some super fancy computery program thing, were she can make her seld teeny tiny and climbs in your ear and reads your mind and makes it a reality,,,ya think..I am not sure , I will have to ask her! I know she could do it for you also! OK...lets review...I now have a great looking logo....now...how about a BLOG! I am a total blog stalker...really...It is major problem of mine...but in my defense...people post some really great stuff on their blogs, they want you to stalk them...right? 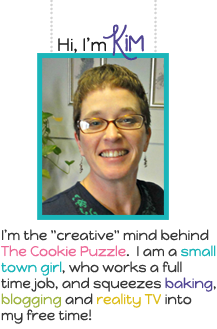 I have made some really great wonderful people through blogs...and one of my all time favorites is Cristin of Cristin's Cookies. Cristin does AMAZING cookies...and she also just happens to be one of the sweetest persons you will ever meet. Well, I have not actually "met" her Per Se...as she is in California, and I am in Missouri, but we run in the same "cookie circle" and are a part of a wonderful group together,and she is a "glaze gal" like me and I consider her a friend..and over time, she is not just a "cookie friend"...she is a friend friend! Have you seen Cristin's Blog? OH MY....it is wonderful..really..you have to check it out...I could spend hours looking at her cookies! And her blog....My girl, Cristin knows some super secret "code" and makes a custom background for her blog for each cookie set she posts! GET OUT! (doing my best Elaine impression from Seinfeld) WOW! Cristin has been such a cheerleader for me, THANK YOU CRISTIN! If you are looking for information about what a blog SHOULD look like...head to Cristin's blog Cristin's Cookies, it looks pretty, it is well organized, it is informative, it is funny...well...it is just everything a blog SHOULD BE! And Cristin, is just tooo toooo sweet...and she has pink hair...you have to love a gal with pink hair! How cool is that....pretty darn cool if you ask me! So there you go...I Have a blog..and it did take a village...a village of three amazing ladies...thank you Lindsay, Erica, and Cristin! I could have not have done this without you all! Sooo...blogging day two...still trying to figure out this puzzle...I know there is a way to make it all come together to make a totally cool blog....I totally stalk other blog...I know that it is possible...it can be done...but how? Let me say this right off the bat...a computer wiz, I am not....and probably never will be. Blogging is like a some strange language to me. What the heck is a widget...or gadget? I want the top of my page to have the picture (logo) in the middle..is that the title...or the topper...or as I like to call it the Toppy Thing..it is a real term, google it....ok don't, cause I totally just made it up. But Toppy Thing, I understand...blogging not so much! So I will keep moving around stuff...clicking on buttons...moving little slide thingies...you know the stuff that people do when they have no idea what they are doing. Yep, that is me...the lady that pushes every button, expecting a miracle...but no...not happening. I have decided that blogging is a little like Autism. It is a strange...oh so very strange....and no two blogs are alike, just like no two people with Autism are alike. Heck, if all blogs were alike, I would get a little bored, cause I am a total blog stalker (that doesn't creep you out does it? ). And people with Autism are all different, I think that is why it is a "spectrum" disorder, because the symptoms vary from person to person. Take my son Collin, blue is is favorite color, followed by green..in that order every time. And he likes "normal" blue, not light blue, or dark blue, it must be royal blue...nothing else will do. Same with the other colors...all normal colors...shades freak him out. Now, I have had the honor of getting to know a sweet lady, by the name of Caron, of Bubbles Bath Boutique (find her here and here ...really go now...I will wait...she has the most amazing bath and body products...She sent me a honycomb soap...AMAZING..bye bye Oil of O*** shower gel) she has a daughter named Carlee, who is on the spectrum also.....Now Carlee...she likes the bright, neon colors...bright blues, pinks, greens, and purples. That is just who she is and what she likes...shades don't freak her out. 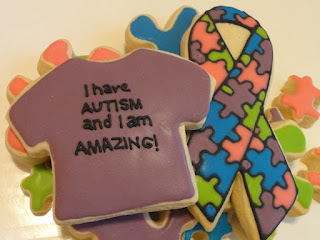 Both primary colored cookies and neon cookies are great..cute..but different...so different blogs are different....and every person with Autism is different...but we still like them all...right?..right!...good! Soo...to bring it all together, here is a little summary.....Blogs are confusing to me....I am one of those random button clicking persons....All blogs are different.....People with Autism are all different. If you can hang with me a little bit..I promise I will get the hang of this. Now each time you come back, things might look a little different, but you don't mind do you? 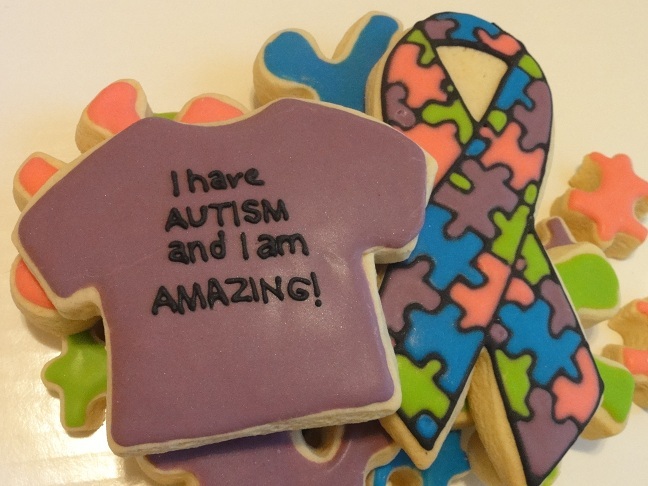 Here are a few more puzzle piece cookies that I did...I thought I might like them..I sure do...cause they are puzzle pieces...and, well, I have come to love puzzle pieces!